Registration for Summer Is Now Open? Our dance program is designed to advance throughout the school year (late August through early June). Each week builds upon the prior week. Each session advances with more difficult moves and technique. We showcase what the students have been learning at our recital in early June. Therefore, we do not enroll new students from February through May. Registration for our Summer Session, which begins June 19, 2019, is now open. We have regular classes as well as Princess Ballet Camps for our littlest students and special technique classes and workshops for our upper level students. Of course, if you have any questiojns, you are welcome to email us any time at MonganDance@msn.com. MULTI-CLASS DISCOUNTS - Discounts for multiple classes per student begin at $12. The discounts are applied automatically. 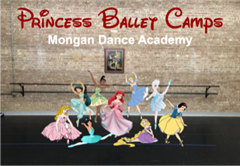 DANCE ATTIRE - Mongan Dance Academy sells the required shoes, tights, leotards, skirts, and dance bags to students enrolled at MDA. Click here to view MDA's Uniform Requirements. ADMINISTRATIVE FEE - A one-time annual administrative fee of $25 per family for the 2018-2019 dance year will be added to each family's account after we receive your child's registration. NOTE: Classes may be canceled or modified based on registration.